According to the Healthcare Cost and Utilization Project – an organization that publishes longitudinal hospital care data in the US – hospital inpatient care accounts for more than one-third of the total cost of healthcare in the United States. This makes it a significant driver in the rising cost of managing disease. 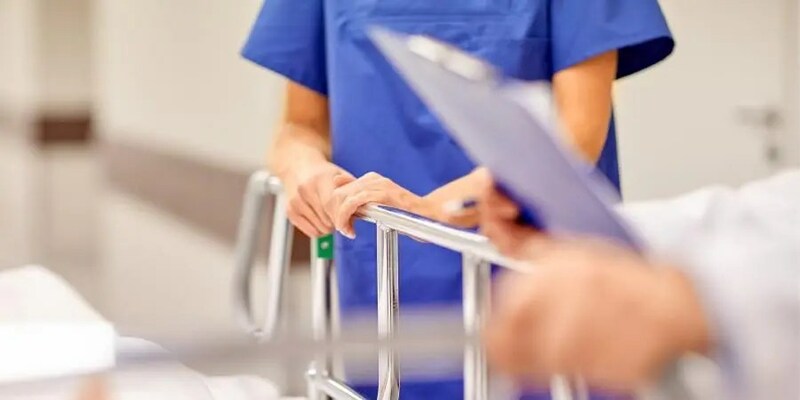 Although hospital inpatient stays are on the decline for many population groups, there is relentless pressure to increase the value and efficiency of a patient’s time spent in a hospital. Efficiency initiatives are evident in every area of a hospital. The audiology department is no exception. Like many specialized hospital services, audiology departments keep a tight schedule and are typically fully booked weeks or months in advance. Almost daily that schedule is challenged by patients, who for various reasons, were not booked for a hearing evaluation, but should have been. This includes overflow from the Ear-Nose-Throat (ENT) department, as well as hospital inpatients in need of acute diagnostic hearing testing. Fitting these patients into an already full clinic schedule can result in backlogs and/or significant delays. Unfortunately, some patients may never get tested at all. Audiology booth space and the audiologists’ time are at a premium. Scheduling limitations pose a challenge when trying to fit in patients who would benefit from immediate testing. Furthermore, additional scheduling challenges are encountered with those who need testing at frequent, and sometimes unpredictable, intervals. Some patients benefit from predetermined auditory monitoring to ensure that there are no significant changes in hearing thresholds due to potential secondary ototoxic (harmful to the inner ear) effects of treatments they are undergoing. Today’s tablet-based audiometers are lightweight, cost-efficient, easy to use and highly portable. They are available on demand, provide various levels of testing capabilities, and can be taken bedside to directly test patients for whom transport, exposure risks, or overall access keep them from going to the audiology department. These systems provide an optimal alternate solution for hearing testing to help address hospital audiology departments’ space and time limitations. These systems are also helpful for patients who are not easily ambulatory, such as those with advanced diabetes, or patients undergoing treatments known to be ototoxic. The tablet-based system in these cases can be used by nurses or medical assistants to quickly determine if the patient needs a more comprehensive evaluation and a referral to the audiology department. 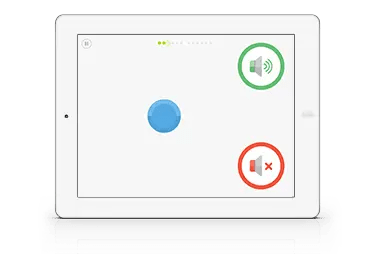 A good number of hospitals, both abroad and in the US, are currently using tablet-based audiometry to monitor their patients undergoing a variety of treatments. Emergency rooms can benefit as well. 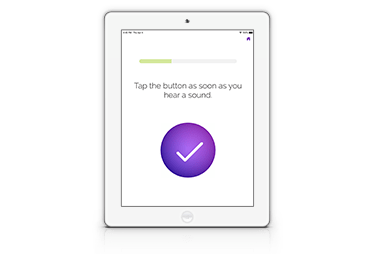 Tablet-based audiometers have the ability to provide valuable diagnostic information about the overall status of a patient in minutes. This is critical for patients who come into the ER presenting with head trauma or sudden sensorineural hearing loss (SSNHL). The treatment and follow-up recommended for these patients is significantly reliant on any changes, or brut values, of hearing levels. Another use for tablet-based systems is in the monitoring of anticipated ototoxicity from treatments like chemotherapy. Depending on the chemotherapy agent used, some of these patients would benefit from screening to assess changes in hearing sensitivity. Tablet-based audiometers provide valuable information to the patient’s care team, all without using specialized resources from the audiology department. Bringing hearing testing to the patient is of benefit not only with respect to hospital resources but can also be a significant benefit to the patient. Patients undergoing intensive treatment can lack energy, feel unwell, and already have many medical appointments to which adding audiology would be a burden. 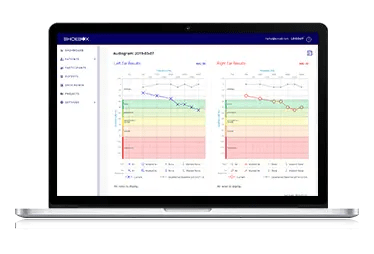 By leveraging automated audiometry to an existing appointment, such as during chemotherapy or dialysis, we maximize the time that the patient is already in the hospital. The best tablet-based systems are intuitive and easy enabling almost anyone on staff to administer an accurate hearing testing. They offer advanced clinical capabilities and offer seamless integrations with hospital EMRs or other patient records systems. 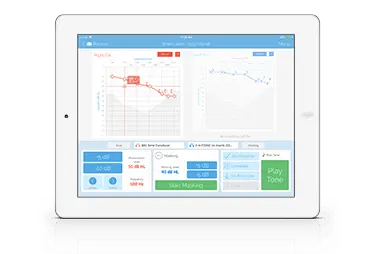 Tablet-based audiometry is easy to obtain and incorporate into any hospital where resources for audiometric testing are at a premium. Low upfront costs are a small fraction of the six-figure price tag associated with adding another soundproof booth and a bulky conventional audiometer to an existing audiology department, if the space even existed to do so. While space and resources at so many of today’s hospitals are increasingly scarce, tablet-based audiometry is just one example of the many innovative products and services designed to help hospitals address these challenges. If audiology services at your hospital are overloaded, overscheduled, or simply not being used to their maximum efficiency, consider the myriad of possibilities offered by tablet-based audiometers for serving patients where they are, and when they could benefit from it most.